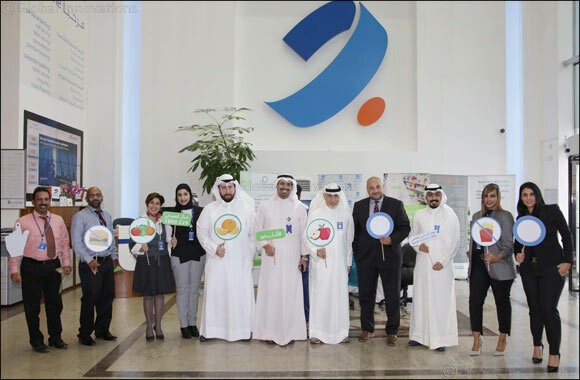 Kuwait – 21 November 2018: Burgan Bank, one of the leading contributors to sustainability in society, recently organized an awareness campaign marking ‘World Diabetes Day’ at its Headquarters in collaboration with “Al-Mutawa Pharmacies”, a partner of Ali Abdulwahab Al Mutawa Commercial Co. Annually celebrated worldwide on 14 November as a global awareness campaign, Burgan Bank's initiative was carried out in support of the cause by educating every one of the disease and its risks and complications in order to ensure all receive the opportunity to change their lives for the better and prevent its onset. On this occasion, a certified pharmacists examined its staff and customers at the Head Office on 13 November, measured their blood pressure and blood sugar levels and inquired about their overall health. The team of experts provided a comprehensive overview of the symptoms of Type 1 and Type 2 diabetes, its treatments, causes and diagnoses. The health practitioners also discussed potential early signs, risk factors and more importantly, how to conduct regular self-help check-ups of blood sugar at home. A special focus was also dedicated to prevention, healthy living through physical activities and a balanced diet. Managed by Ali Abdulwahab Al Mutawa Commercial Company, Al Mutawa Pharmacies is one of the leading pharmacies in Kuwait and owns more than 25 pharmacies distributed all around Kuwait. The network is run by a group of specialized pharmacists who are available 24 hours a day 7 days a week and in addition to a call canter, customers can call on 1800229 or what’s app on 99800228 for any questions surrounding treatment methods, medicines, or general provisions available including a free delivery service following the current mandate by the Ministry of Health. In 2017, Kuwait currently ranked seventh worldwide in the prevalence of diabetes with over 23 percent of Kuwaitis suffering from the chronic disease. The country also holds the highest rate of sufferers among the top 10 countries in the Gulf Cooperation Council (GCC) out of which one in five people are reported to have Diabetes.